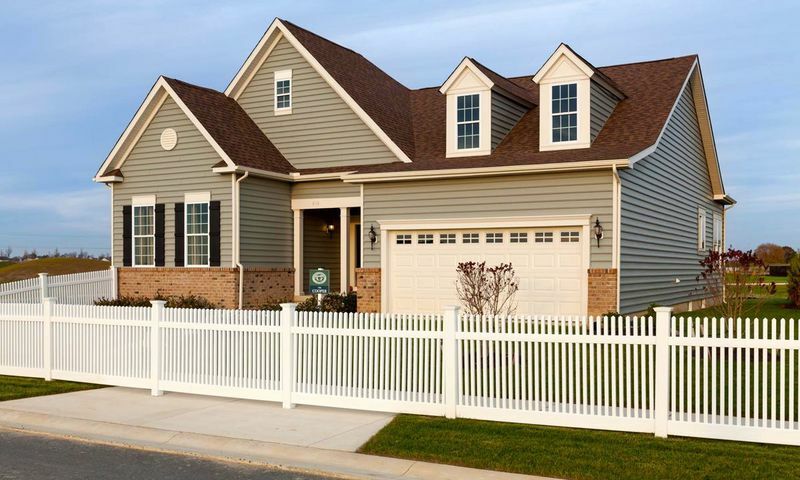 The Ponds at Bayberry is a new 55+ community in Middletown, Delaware. Set in New Castle County, this community will consist of about 500 age-restricted homes upon completion. Listening to the wants and needs of active adult homebuyers, Blenheim Homes is developing this neighborhood to include a well-appointed clubhouse complete with outdoor amenities. Situated within the master-planned community of Bayberry, residents will enjoy acres of tree-lined streets the company of friendly neighbors. The Ponds at Bayberry is ideally located near major roadways as well as recreational opportunities along the Delaware River. The Ponds at Bayberry is slated to include indoor and outdoor amenities to stay socially active and physically fit. The planned 9,000 square-foot clubhouse will include a ballroom, multi-purpose room, hobby and game room, and card room. Residents will never have to travel far for an invigorating workout because they will have access to a fitness center and aerobics studio. The thoughtful amenities will continue outdoors with a swimming pool, walking and biking trails, and natural open space. Those who enjoy competition will enjoy taking advantage of the planned tennis and bocce ball courts as well. Active adult homebuyers can build the retirement home of their dreams from the models offered in Artist Series. There are six floor plans that range in size from 1,376 to 2,649 square feet. These single-family homes include two to five bedrooms, two to four bathrooms, and an attached two-car garage. The Ponds at Bayberry offers beautiful homes without having to give up size and style. Ideally designed for active adults every home includes first-floor master suites, low-maintenance siding, nine-foot first-floor ceilings, and energy-efficient appliances. Once the clubhouse is completed, residents will enjoy their carefree lifestyles by starting clubs, attending classes, or hosting events. Additionally a future town center will provide places to grab dinner with neighbors, shop for daily conveniences, and more. The Ponds at Bayberry is located in New Castle County. This age-restricted community in Middletown, DE is about two-and-a-half hours from New York City and Washington D.C. Philadelphia, Poconos, and beaches can all be reached in two hours or less. When traveling farther is needed, both Summit Airport and New Castle Airport are easily reachable. Closer to home, there are a variety of golf courses, attractions, and outdoor recreation areas. Golfers of all levels will appreciate living near Back Creek Golf Club, Frog Hollow Golf Club, Odessa National Golf Club, and Cavilers Country Club. Those looking for culture will enjoy the nearby historic Everett Theatre hosts concerts, festivals, plays, and lectures throughout the year. With a variety of restaurants, medical facilities, and shopping opportunities, it's easy to see why The Ponds at Bayberry is a sought-after 55+ community in Middletown. There are plenty of activities available in The Ponds at Bayberry. Here is a sample of some of the clubs, activities and classes offered here. Homebuyers can find a new single-family home that offers 1,376 to 3,121 square feet of living space. These lovely low-maintenance residences include two to five bedrooms, two to four bathrooms, and an attached garage. 55places.com is not affiliated with the developer(s) or homeowners association of The Ponds at Bayberry. The information you submit is distributed to a 55places.com Partner Agent, who is a licensed real estate agent. The information regarding The Ponds at Bayberry has not been verified or approved by the developer or homeowners association. Please verify all information prior to purchasing. 55places.com is not responsible for any errors regarding the information displayed on this website.